A couple weeks ago a reader asked me to do a post on how to take blog pictures in college, and while I wish I had the perfect answer to that question, I definitely don't. Since being in college, I have only been able to do about 3-4 photo shoots while in my college town. I'm sure any blogger transitioning to college has experienced this weird time where you can't seem to find any time in the week to go take photos. And photo shoots are definitely an ordeal that takes a lot of planning and coordinating. So while I don't have the best advice for finding time to take pictures and blogging, I want to give you all some advice that I've been using myself for my first semester blogging at college. If you don't have time to post high quality photos on your instagram profile, continue to post photos and videos through your Insta story so you can still receive engagement from your followers (and show that you're still around!). Sometimes I can only get one high quality photo up on my profile each week, but I will try to post several instastory photos throughout the week so my followers know I'm still engaged in content. Another aspect of this is utilizing Instagram Live and polls- all of which can help your readers stay engaged and active on your page. If you are completely out of time and ideas (which I have been more likely than not this semester), don't force it. Today I tried to write out a post about some things I currently have my eye on, but I just didn't think it was worth completing because I wasn't a fan of it and I knew it wasn't my best work. Your followers will still follow you even if you don't get posts up on the blog. As long as you're remaining active on other social medias, you can still have a presence in the blogosphere. Don't get caught up in posting several times a week. Aim to post once a week (or once every two weeks!) and make sure those posts are high quality. If you are headed off to college, now is the perfect time to purchase a high quality camera. My parents passed theirs down to me so that I could continue blogging at college. Even if you don't have a camera, chances are you will find someone at your college who will gladly take them for you (rather that be a hallmate, classmate, or even a good friend!). I have found several friends of mine who are willing to take photos for me every so often. Whenever you do find to take photos, block out a good portion of time and take multiple outfits with you. While this might seem daunting at first, it's probably easier than finding several smaller chunks of time to take mini photo shoots. Every day I am constantly on the lookout for places on and off campus that would be great for photos. College campuses are generally perfect for bloggers because the landscaping and architecture is generally appealing. Off campus, especially if you are in a city, is probably your best bet for blog photos but it can sometimes be a hassle to leave school for such endeavors. If you are wearing a blog worthy outfit one day, ask a friend to snap some photos with your camera. I do this sometimes when I dress up to go downtown because you're already dressed and ready for photos, so why not kill two birds with one stone? If you are swarmed with homework and activities, find some friends who are willing to write guest posts for your blog (or even blog about one of their outfits). This is a great way to vary your blog and keep readers interested, but it's also a savvy trick to help you out on time and getting your posts up. This is the hardest one. I can't give advice for finding time, but a good rule to follow is that if you love doing something, you will make time for it. I don't mean you should put your blog ahead of studying, but blogging can find its way into your schedule. Think about the time you watch netflix. If you spent maybe one episode writing a post, you would easily be able to place blogging into your daily routine. Sometimes when I'm cranking out work for a while, I'll take a 30 min break and just blog. You don't need multiple hours to blog, just 15-30 min here and there. I hope you all found this helpful- I definitely needed help adjusting to blogging in college and I'm still not an expert (as I'm sure you all can tell- my posting schedule is definitely going downhill). I really hope that next semester I can start getting into a blogging routine and take photos more often, but so many factors plan into photoshoots and blogging that sometimes it can get a bit stressful. If you're a college blogger, what tips do you have for maintaining your blog, social life, and school work? How did you transition from blogging in high school to blogging in college? I'd love to hear your thoughts! Loved this post Madison! Thank you so much for sharing! Thank you for the idea! I hope you found it helpful! Love this post! I’m a junior in college, trying to start my first blog, so I can definitely relate to finding time for everything. But I think you did a great job with these tips, all of them I use!! Thank you! Good luck starting your blog- it's such an incredible journey! Thanks!! 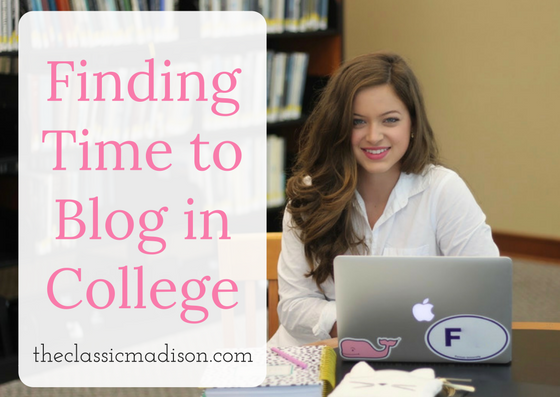 Yes scheduling ahead is a must in just about every aspect of college-especially blogging!